How to Clean Really Tarnished Silver Naturally! 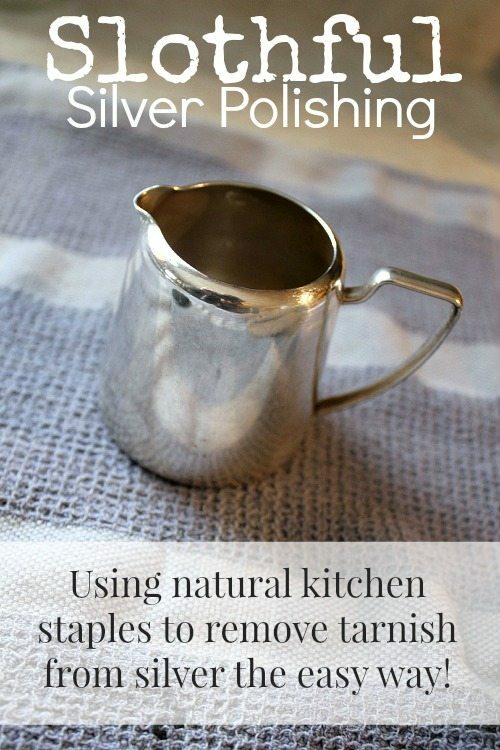 How to clean silver naturally, even if it’s really tarnished! The tarnish just melts away with this trick! Or maybe it’s just that I’ve had no time for scrubbing and buffing and polishing this last year or so. I’ve always used toothpaste for polishing silver, actually, which works great. It does, however, require a bit of elbow grease, so that just isn’t the right solution anymore for this time in my life. First, line the bottom of your sink with aluminum foil with the shiny side up. Next, add in as much tarnished silver as will fit and sprinkle it all with about a cup or even a bit more of baking soda. Next you’ll need some really hot water. I boiled about 10 cups on the stove, poured that into the sink and then topped the water level up with hot tap water until everything was covered. A side note for all of you country dwellers: I used good ol’ well water and not the fancy filtered bottled water we have for drinking and that worked just fine. It didn’t affect the sciencey bits of the process at all! Yay! I’ve read about this technique from quite a few different sources and some said that you need to leave your silver to soak for 30 minutes or so. This isn’t true! The chemical reaction that occurs happens instantly! There’s a strong sulfur smell at first and you’ll actually be able to see the silver turning brighter as the water level in the sink rises and covers more tarnished surfaces! Once that reaction happens, you just need to either pull your silver pieces out with some tongs or wait until the water won’t burn your hand. Then just rub them quickly with a soft cloth and they’ll be good as new! Or better than new really, because they just don’t seem to make things this pretty anymore! I’ve done a few more batches since I took these photos and I did notice that the tarnish did seem to cling a bit more to some of my more ornate pieces. They were still a lot brighter, but I’d still like to go over them with a soft toothbrush and some toothpaste to get into all the nooks and crannies. Still, not bad, right? This trick to clean silver naturally was so fun to play around with! It was so neat because you can actually see the tarnish transferring to the aluminum foil! I’ve also read that some people say you should also add salt and vinegar, but that seems almost unnecessary to me. I’d say keep the recipe as simple as possible! Do you have a favorite way to polish all of your best silver pieces? Toothpaste is abrasive & could scratch. It actually contains ground rock – that’s how it removes tartar. But I have used it with a soft toothbrush to clan the design in silver spoons. I am SO HAPPY to know this works because I have a lot of hand-me-down silver platters, etc. that need to be cleaned/polished! Well then, you’re going to love it! You’re going to want to put them all on display after this! I actually use this method to clean my silver. You know I never noticed the dust yesterday or the splash back today until you mentioned it. Your home is beautiful and you actually live in it. I like that. Haha. Thanks, Patty! I like actually living here, so that works out well. 🙂 I thought I’d better call out the dust and spills that show up accidentally in my photos just to prevent anyone who’s in a mean mood from doing it for me! O, did this come at the right time! I have a stash of things that are old and very tarnished. A dreaded task sometimes. This will make it fun. Does it work on jewelry as well? Things with stones? tips….makes life so much better. Aww! Thanks, Joan! You totally just made my night! There’s nothing I like more than the thought of sharing things that end up actually being useful to people! This should be totally fine to use on any silver you have, even jewelry! My tea pot and coffee pot have a sort of a resin for the handles and they were just fine! They’re very old so I wouldn’t hesitate to use this method on anything. It actually seems like the most gentle method from what I can! Thanks this seems easy enough. I just got several pieces from yard sales. But I have a stainless steel sink is that ok? Wow! I’m pinning this to use on my silverplate. Thank you for sharing ! Also, Courtenay, I am receiving two copies of your blog in my email. One powered by google, and the other by mad mimi. How can I just get one ? Thank you !! Hi Patty! I’m so glad the silver cleaning trick will come in handy to you too! I did find where I had your email in my list twice, so I’ve removed one and you should only get one email from now on. Thanks for letting me know! Please tell me if that doesn’t fix it and I’ll look into it some more again! I actually did this a few years back but it didn’t work as well for me, maybe I didn’t get my water hot enough. Only used hot from the facet. I need to try again with the boiling water method as some have lots of intricate work on them. Definitely boil your water! If it can work on my silver, which was in really really sad shape, I’m totally certain it will work for you! Didn’t work for me either! I used boiling water and topped up with some very hot water as told, but silver looks like it did before (maybe because it was less tarnished than in photos?). I only put 2 teaspoons and a small tray in the sink. Would this method work on silver rings? Totally, Elizabeth! Although if you’re just doing rings, you can just put a bit of foil in the bottom of a bowl! Thanks Courtenay. I have used this method, but without a great deal of success. I’m thinking I didn’t have the water hot enough. I didn’t know about using toothpaste, so that may be a good method to use for the intricate details on my cutlery. I don’t like commercial cleaners as they can damage the silver. Definitely try boiling the water first, Jenny! I was so amazed at how well it worked for me. If it can work on my super-tarnished silver, it can work on anyone’s. I’m sure no one’s let their silver get as bad as mine! I love the simplicity of this technique. I have a few pieces that need cleaning, I will definitely be doing it this way! Thanks! Hope you love it as much as I do, Cindy! I have read about versions of this over the years (but none mentioned the hot, hot water). I have not tried it because I was afraid that it might pit or damage the silver. Are you sure that this is safe in the long run???? I have a lot o old silver from my mother…..of course even if it pits it would be better than being black!! Hi Sharon! Since I don’t know the exact state of your silver, I can’t say for sure how risky this is, but I think it’s a pretty low-risk way of cleaning overall. You basically just dip it in water and it comes out clean. I like that there’s nothing abrasive at all about it and I know it’s a very popular method for using on jewelry, which you can bet people don’t want to cause damage to! I know this is the way that I’ll be using on my own old silver pieces from now on. I do agree that even if the only way to polish silver was really damaging, it’s better to have it out and to enjoy it than to have it hidden away, tarnished, and unloved! Some people don’t want to clean the design on silverware – they want the pattern to show. And I had read an article about never putting your sterling and stainless steel pieces together in the dishwasher, because that does cause some kind of chemical reaction and might pit the silverware. Hi, love this method. I read somewhere that if you use lemon juice in the rinse the silver will not tarnish as quickly afterwards. Not sure how true this is because I never documented it when I did and didn’t do this. Fascinating! I wonder if that’s why some of the recipes call for vinegar! It’s been a few weeks now since I’ve done the first bath and they’re all still perfect and shiny. I thought this was going to be a once a month job, which I didn’t mind cause it’s so easy and totally worth it, but it looks like the shine will be lasting much longer than that! Aw, thanks so much, Jenny! So glad you liked this one! This totally makes me want to hit up second hand stores and look for tarnished silver and get a heck of a deal! Thanks for the tip!! I see so many amazing great old silver pieces there all the time! Good luck with it, Diana! Will try for sure! Do you have any ideas on how to clean bronze and copper his fast and easy ? Will this work as well? I noticed you did this a stainless sink, I’ve always done this trick a glass bowl. Did it do anything to the finish of your sink ? Great tip! I just found a wooden chest full of silver pieces, all have a decent amount of tarnish. I am definitely doing this! Tienen esta información en español ? It produces Aluminium Sulfide and Sulfidric Acid…not so healthy. I was researching your response and can’t find anything. Did you spell them correctly? Sulfuric acid? Aluminum Sulfate? I have used this method. I also had some clingy tarnish on the ornate areas. I used a soft toothbrush while the pieces were in the solution. It allowed the solution to really get under the tarnished areas and make them shine. I did not have to touch them up at all. Just wiped them with a soft cloth. I left the pieces in the solution until the water cooled, which gave me time to go over them with the toothbrush where needed (about 30 minutes). Hi there! Does anyone have a good solution for grimy old copper with the green stuff on it? I tried calling ketchup. No success. Thanks! Hot Sauce and newspaper. We used this in the navy and it shined copper up really quickly. Try to use black and white paper as it works faster. Apply a few drops of hot sauce to the copper surface and then rub with the newspaper. In elementary school we let pennies soak in hot sauce and they cleaned on their own but it took a while. You can use just newspaper when the build up isn’t as bad. I don’t know if you ever found an answer for this but I have used just hot soapy water on copper and it works great! Any advice for cleaning copper? Squirting ketchup on it and letting it sit for a few hours works, or a half of a lemon dipped in salt works a bit quicker! Hope one of those tricks works for you! Wash off any oily or dirty residue, then make a paste out of vinegar and salt and scrub your item with it. Wash again, then dry. I’ve used this method for over 35 years and it works beautifully. Sorry everyone. If you click the link Federico posted, the sulfur smell is gaseous Hydrogen Sulfide which has been linked to poisonings similar to cyanide poisoning. I’m not certain how much inhaled gas is toxic, but there are a slew of online articles about Hydrogen Sulfide poisonings. If you are looking for a non-toxic way to clean silver, this most certainly isn’t the way to go. Bummer since it is so simple. Do you know if the hot water is necessary? Or would it work just as well in cold? I’ve only ever used hot. I think it probably speed the process up, it’s worth a try with the cold water though if you’re curious! I do the same… Except my recipe (my mom’s) told me to use plain old regular POWDERED Tide detergent. ??? I have a lot of silver as well to clean. Found lots of items at Good Will. I also live in the country and not sure how safe the water would be to go down the drain after the cleaning is done. Is it possible to do the items in a rubber dish pan? That way I am not inhaling the fumes and I can poor the water outside. Any other advise would be great! Hi Jen! This isn’t a new method at all and I know a lot of people have done it for years and years without any issue, but of course, if you’d rather be safe than sorry, you can definitely do the items outside in any kind of dishpan. Just line it with aluminum foil first and you’ll be good to go! I’ve done a few batches in a big ceramic bowl and they turned out really well. Good luck! Yay! That’s great to hear, Lorie! My silver is definitely due for another de-tarnishing so I’m looking forward to seeing the magic happen again! This works! My silver flatware is as beautiful and shiny as it was when it was brand new. Have done this for years except I used a large pan. handful of aluminum foil waded up, handful of baking soda and bring that to boil. Turn heat down. Dip my pieces in for a few seconds. Done… replace the aluminum foil if it quits working. Does this work on sterling silver only, or can this be done with silver plate? 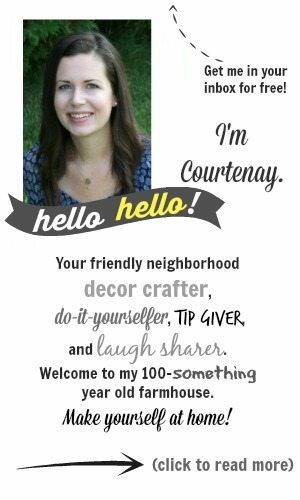 Hi Courtenay, God I just love all your posts. Yay on the silver idea although I have 2 silver goblets that I think the silver has kind of worn off…..do you know how to re-silver? Or can I just spray paint? and if so could I drink out of them?? Boy am I a dunce. Also I love that grey dresser. Did you paint that? And if so, what color was your paint? Hi Lynda! Well, you could definitely spray paint the goblets, but I wouldn’t drink out of them after that! I think they’d have to be kept just for display. Maybe you can find someone locally to fix your goblets for you? It seems like a good idea to have a professional do it in this case. The dresser is a color called Dover Grey. I painted it probably 9 years ago and I still love it. I think you can find this color at Lowe’s still! I tried this last night and seems to be not so shiny. Do you use the baking soda that is bicarbonate or should it be carbonate?? Can this process be treated more that once? Hi Laurel! My baking soda’s bicarbonate. Try rubbing the silver with a slightly damp polishing cloth after you finish the process if you still see a bit of tarnish. Sometimes it takes a couple of treatments if the tarnish is really really heavy, or just the tiniest bit of elbow grease afterwards. Hi Courtenay, I won a large sterling silver tray as a trophy many years ago that is very ornate and very tarnished now and I really want to try this method to clean it but as stated, it is large and will not fit in a sink so I will probably have to do this in my tub which is white and ceramic. Unfortunately it is too wide to fit in a plastic bin. I know you said that it did not damage your stainless steel sink but do you have any idea if it will leave any residue in a white ceramic tub? Hi Kimberly! It should be totally fine in your tub. The great thing about this is that all the tarnish sticks to the aluminum foil. Good luck! I remember a chemistry professor in college teaching us about this. He said something about how when silver tarnishes, it is a chemical reaction and when you polish it, you are stripping away some of the silver. Whereas, with this method, you are just reversing the chemical reaction that caused the tarnish. I have a 55 year old, engraved with my name on it, baby cup that I have always wanted to clean correctly. it means the world to me, as a keepsake, and am excited I decided to look this site up. I will try and take before and after pics, and keep you posted, and hopefully share some sparkling results. Thanks! Hi I would think that you could use those foil pans that you find at the store to roast turkeys in also. I have not tried this method that you are suggesting but will give it a try. Hi Patrick! Thanks for sharing that idea! That’s a great one actually! I first tried this method in seventh grade when our science teacher assigned it as homework. We were studying the difference between physical and chemical reactions. This is a chemical reaction. Those sulfur-smelling fumes caused me to spend the rest of the night throwing up. I’ve avoided this method until I decided recently to try it again half a century later. This time I used my exhaust fan, avoided inhalation, and immediately disposed of the solution (outside) after using. It didn’t cause vomiting, but did give me a headache and mild nausea. (I had the same reaction in my twenties when I tried using a silver-plating solution that contained toxic chemicals to suspend the silver in the liquid, not sure whether these incidents were caused by the same sensitivity, but I suspect they were.) Not everyone is as sensitive to toxins as I am, I’m sure, but your readers should be aware that this method of silver tarnish removal is not benign merely because it uses “natural” ingredients. There are plenty of examples of harmful natural substances. Maybe someone who understands the chemistry of this method can weigh in on how this method works. 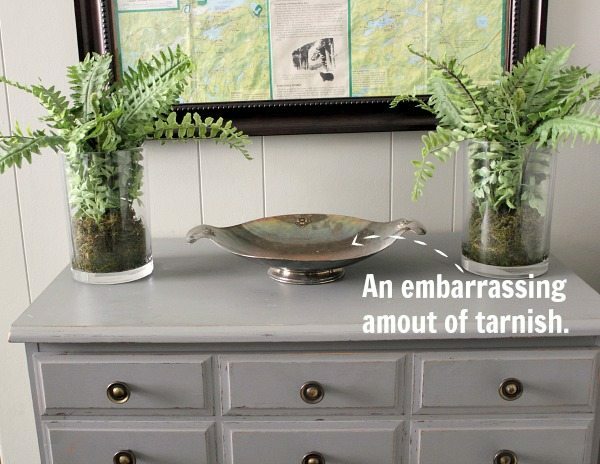 All this said, there’s no doubt that this is an extremely effective method to remove tarnish! I tried the toothpaste on an silver bracelet that was my grandmothers, worked like a charm! Thanks! Only do this on silver or plate you don’t care much for, it actually REMOVES ALL THE PATINA AND A MICROSCOPIC LAYER OF THE SILVER! If you have true heirloom pieces this will deface the value, drastically! What is happening is an electrostatic reaction that chemically removes a fine layer! This really hurts plate as plate is only so thick! Question – do you rinse the silver or just rub it dry. Hi Rose! I just dry it off with a soft cloth!